My favorite childhood holiday through the wonder years of the Sixties was the 4th of July. I had no precocious notions of patriotism, not one noble sentiment of love for country. I just loved fireworks. Sparklers (Please…don’t plunge them deep into the retina of your sister…yes ma’am, I’ll be careful), lava-flowing glow worms that mutated from fire to molten ebony marking our driveway with a trail of patriotism identifiable in the concrete for years to come. Pop bottle rockets that never saw the translucent green glass of a pop bottle, only the synchronized whip like action of fleshy adolescent palms, flinging the firecracker on a stick into the smoky haze of summer evenings. Black Cats, Lady Fingers, Whiz Bang Spinners…we all had favorites. But my favorite firework was the Family Pack…no, there wasn’t a fuse to light, it was more like a candle or blow torch and it wasn’t condoned by the Certified Firework Makers of America. It was the remains, the bottom of the box of the Family Pack, when my Dad got tired of shooting them off one by one on a particular July 4th evening and he said, “Light ‘em up.” And we did. Roman candles, pop bottle rockets, Lady Fingers, Whiz Bangs, Cherry Bombs…whatever we hadn’t lit yet got lit…or more to the point, set on fire. And so that was the culmination of our pyromania one muggy summer evening in our backyard in Oklahoma. It was memorable…and colorful. And it was hard on the heels of some other fireworks in 1964 & 1965. The Civil Rights Act of 1964 and the Immigration Act of 1965 marked the year the Family Pack got lit all at once. Even as Lyndon Baines Johnson assured nervous Americans that the passage of the Immigration Act was not significant and “not a revolutionary bill. It does not affect the lives of millions…”, he would tell us. And Ted Kennedy hastened to assure Americans that the demographic mix would not be changed. Oh my, how wrong was Ted? Immigration law at the time of the passage excluded Latin Americans, Asians and Africans in quotas and preferred northern and western Europeans over southern and eastern Europeans. And so in the volatile Sixties as I just began to understand that not all folks were white, something exploded, not just in our backyard, but in our collective national conscience. Had LBJ any sense that he had become like my Dad losing patience with lighting Lady Fingers one at a time? 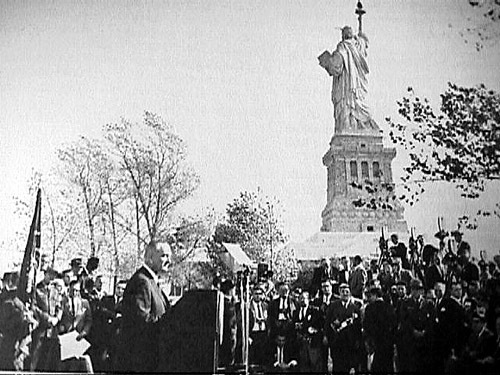 As he signed this Act into law at the foot of the Statue of Liberty, he unwittingly lit the Family Pack ablaze. The notion of a melting pot where all cultures and colors create a kaleidoscope of thought, economic clout, creative energy, entertainment power and sports competitiveness is the world we live in today. It’s the Family Pack exploded. It’s tattooed, brilliant, loud, participatory. 1964 & 1965 were watershed years, the years of the Civil Rights & Immigration Acts, the years through which we emerged from pale skinned, crew cut, male-dominated culture. The Celtics and the Packers were winning all the championships. It’s hard to find a more white working class culture of sport and middle American culture than the Packers and Celtics. Upon the shoulders of the Civil Rights Act and the likes of Rosa Parks, Dr. Martin Luther King and many others, places like Atlanta and Memphis and Charlotte, became national and international cities in the years following 1964, places with African-American mayors and sports stars. Atlanta’s Fulton County Stadium was a project enabled by the Act of 1964. On faith and a prayer, the stadium was built and soon Henry Aaron came to town to play baseball in the deep south. My memories of 1964 are innocent of legal and social and racial tension. I remember a teenage garage band a block away serenading the neighborhood on summer evenings trying to be the next Beach Boys or Beatles. I remember playing kick the can and a neighborhood where we all knew one another and actually spent time in each others homes. 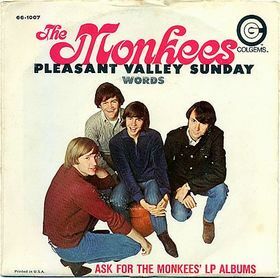 And there was truth in the sarcasm of The Monkees song, Another Pleasant Valley Sunday, it was the suburbs and there was charcoal burning everywhere along with the haze of spent fireworks. Drive in movies, anything with a car…Sunday drives, cruising main street or the burger stand or Dairy Bar. I remember playing basketball with the neighbor kids in our driveway and hearing the great sonic boom of jets flying over through the sound barrier. Space and the sky was the frontier and the United States of America, well, we were the cowboys. There wasn’t anything our American ingenuity could not conquer. The sound barrier, the Soviet menace, the moon. Except perhaps the bullet from the rifle of Lee Harvey Oswald. And so as F. Scott Fitzgerald famously said at the end of The Great Gatsby, “… we beat on, boats against the current, borne back ceaselessly into the past.” 1964 was the year Camelot came undone, our innocence ended, and we were borne back ceaselessly into the past. We were being borne back to the beginning of democracy, starting over, all in now. We became a country of color, of pastels, of diversity, in the years following 1965. It was during the summer of my early youth in the white-bread suburbs when the world was exploding in color and I watched my Dad light a Family Pack of fireworks, when the door was cracked and the kaleidoscope of light spilled into my world, my town, my country. Little did I understand about other colors and cultures and races, but neither did LBJ…or my Dad…or any of us. We were simply enjoying the fireworks in the summer our country burst forth into brilliant color. I’ve outgrown my love of fireworks and exploding things with fuses. But I still love color and the freshness and life and vivid interest it brings into my world. A world filled with much more to eat than just hamburgers and potatoes, a world awash with the sound of much more to hear than the simple earthy English of the midwest, a world with much more to see than the brown-haired freckled faces of my youth, a world that challenges me to understand my place in it, to be proud of my heritage, proud of my country, proud of my family…even as I admire all the voices and faces and smells and foods and ways of those born far from the smoke of my own backyard. 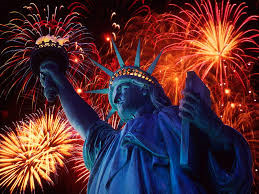 Happy 4th of July to our great nation, The United States of America!